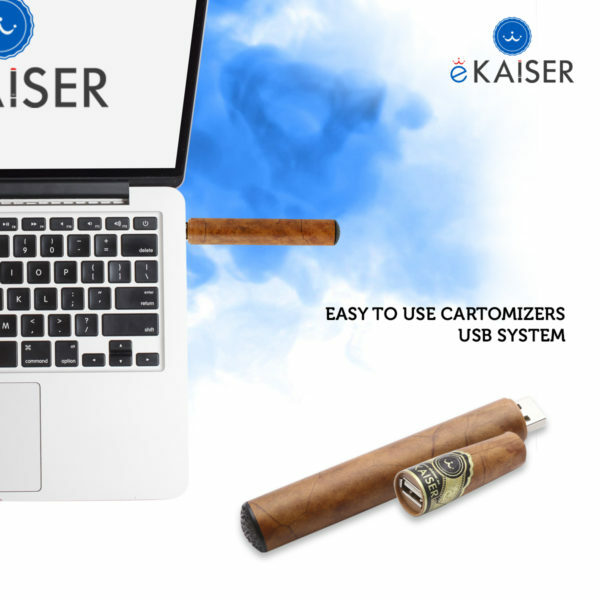 – eKaiser USB Cigar – an electronic flavoured e Cigar with a realistic design and an innovative recharging system, via internal USB connection. 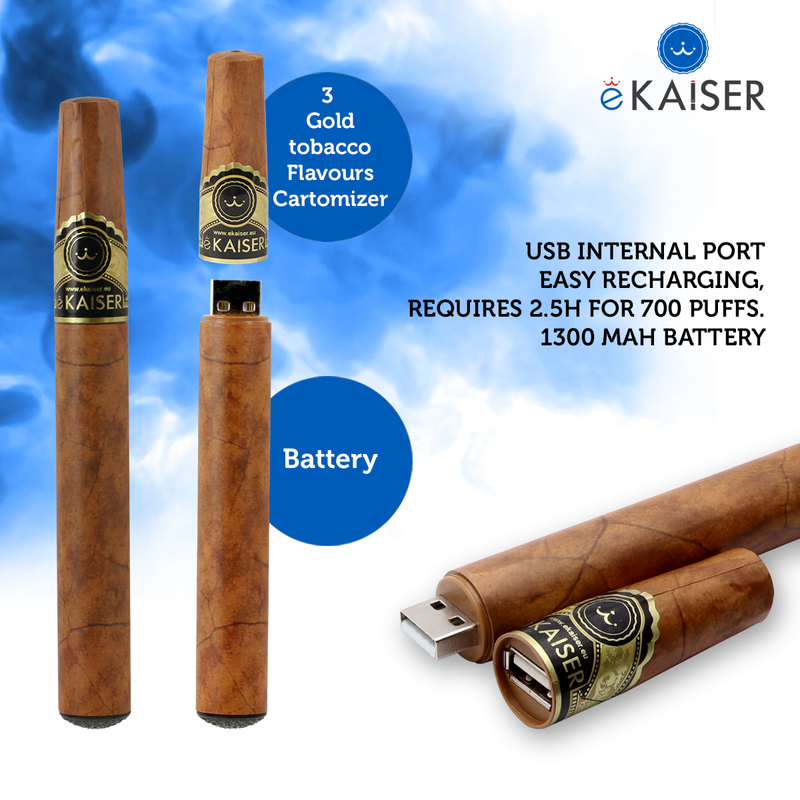 – The pack contains one already charged USB Battery and 3 pre-filled Gold Tobacco Cartomizers, so you can start vaping straight away. – The USB Cigar has a ‘real leaf feel’, making it comfortable to hold and use, providing an authentic experience. 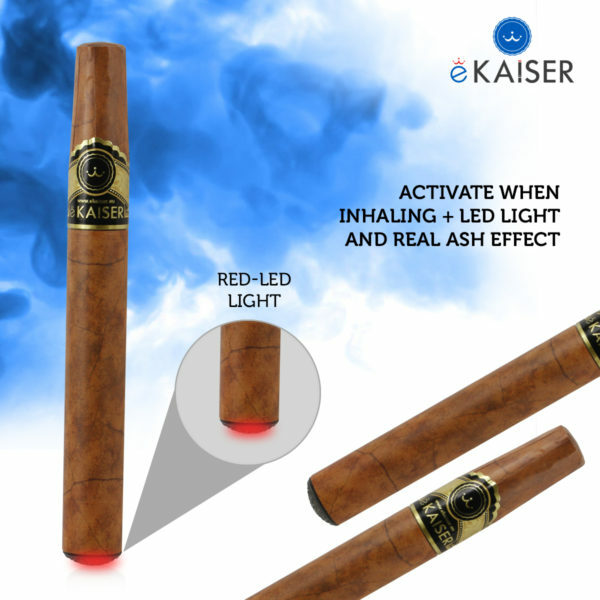 – Activates when inhaling, it features a LED tip for a “real-ash” effect and for displaying the battery’s status. 3 hours required to fully charge. – 30/70 PG-VG e-liquid, containing only pharmaceutical grade ingredients. 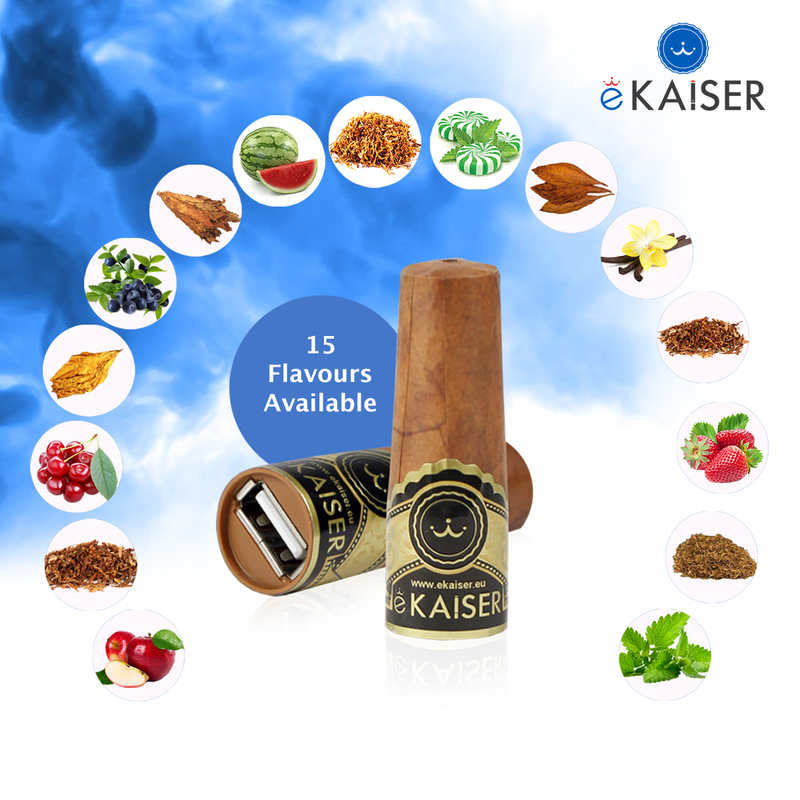 Over 15 flavours sold separately from eKaiser. 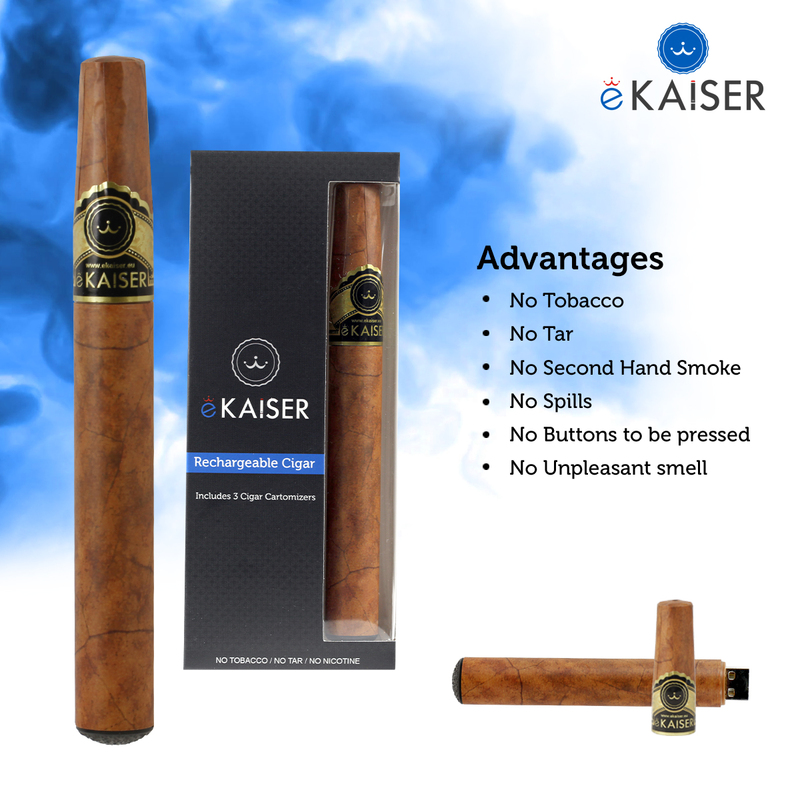 – Designed for health-preoccupied smokers, the eKaiser USB Cigar is a tobacco-free electronic e Cigar with an unique design – looking just like a real cigar, this vape has a ‘real leaf feel’, making it comfortable to hold and use with an authentic flavour. – It features a practical and innovative style of charging via an internal USB connection, which doesn’t require any extra USB cables. Plus, the battery can last up to 900 puffs when full. 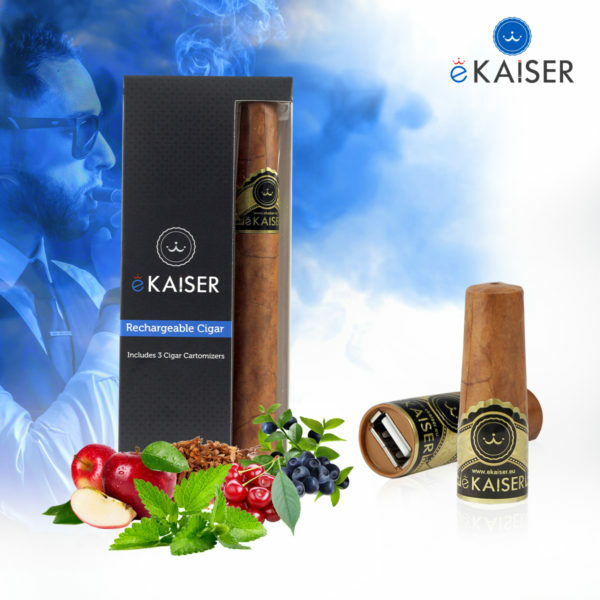 – No buttons required – this e-cigar activates when inhaling, which makes it simple to use and safe to carry inside your pocket or bag. – The Kaiser e Liquid in the cartomizer is created from the finest raw materials and pharmaceutical grade ingredients, using the most advanced production techniques and quality control processes to enable conformity to the highest international and pharmaceutical standards. – Over 15 different flavours for the replaceable Cartomizers are available to be purchased separately. 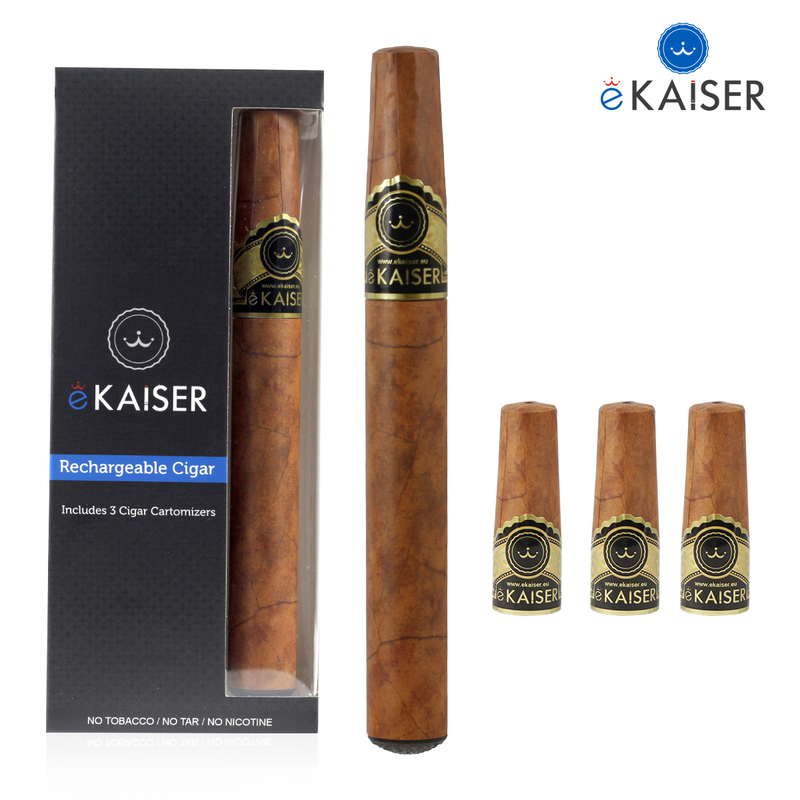 – All flavours are nicotine and tobacco free, 30/70 PG/VG. – Propylene glycol gives more of the throat hit while Vegetable glycerine gives more of the vapour clouds. – It was determined through extensive research that the 70/30 (PG/VG) mix was ideal, and was able to deliver the most satisfying experience for smokers. – Vegetable glycerine is a heavy and sweet-tasting liquid. Propylene glycol, is thin, but even sweeter than VG. – The 30/70 mix from eKaiser contains the ideal measure of both types, allowing you to get a strong throat hit, a thick vape cloud and tasty flavours. Fantastic product. Smokes great. Looks great. Just make sure you know it’s nicotine free. Love the taste and service (the latter one was VERY RAPID!!! 🙂 )Definitely will buy from the same seller the same e-liquids again. 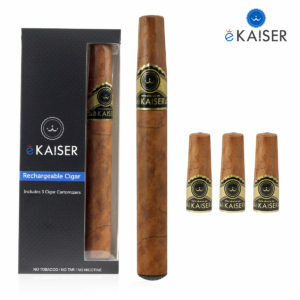 The E-cigar itself is very good and looks like a cigar although slightly heavier. The flavour heads that come with it are Golden Cigar flavour which tastes very sweet more like Maple Syrup flavour. I suggest perhaps sending the cigar out with Classic Cigar flavour as this proved a more authentic flavour for me. No problems so far but haven’t yet needed to charge the battery up. Recommended to those cigar smokers who want to quit the nicotine habit, although I still smoke a normal cigar once a week.